Ontario Premier Doug Ford speaks in Saskatoon, on Oct. 4, 2018. 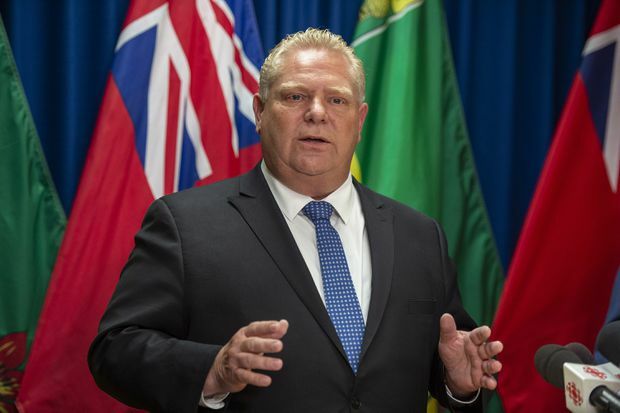 Ontario Premier Doug Ford took repeated aim at Justin Trudeau on Tuesday during a rally to mark the Progressive Conservative government’s first 100 days in office, accusing the Prime Minister of using jobs in the province as “bargaining chips” in recent trade talks while touting a growing alliance to fight the federal carbon tax. Speaking in a small but crowded banquet room in Etobicoke, a western Toronto suburb, Mr. Ford told several hundred supporters that Mr. Trudeau left Ontario farmers, along with steel and aluminum workers, out in the cold when he struck a new trade deal with the United States and Mexico. The United States-Mexico-Canada Agreement (USMCA) gave the United States new access to the Canadian dairy market, although the federal government has said it will compensate farmers for market losses. U.S. tariffs are still in place on Canadian and Mexican steel and aluminum, and Ottawa has said it continues to seek a resolution. “They used Ontario jobs as a bargaining chip, and Justin Trudeau is out there taking a victory lap without giving honest answers about what he will do for the people he’s left behind,” Mr. Ford told the crowd, many wearing Ford-branded t-shirts. Mr. Ford supported the Trudeau government during the trade talks, but since the new agreement was reached, has become more critical. Mr. Ford said he met with the U.S. Ambassador “countless times,” and spoke with numerous U.S. governors. “It’s not just about getting a new deal, it’s about getting the right deal,” he said. Mr. Ford travelled last week to Western Canada, where he met with Saskatchewan Premier Scott Moe and United Conservative Party Leader Jason Kenney in Alberta, both of whom oppose the federal government’s plan for a carbon tax. “The good news is our alliance against the carbon tax is growing,” Mr. Ford said, noting that both Manitoba and Prince Edward Island are opting out of the federal plan. “From coast to coast, people across Canada are standing up to the carbon tax scam." The Prime Minister’s Office referred questions about Mr. Ford’s comments to Intergovernmental Affairs Minister Dominic LeBlanc. “We hope that all provinces and territories continue to take the positive, Canada-first approach that served Canadians well over the last 13 months,” Mr. LeBlanc said in a statement. The Ontario Premier, who didn’t once mention NDP Opposition Leader Andrea Horwath, instead attacked former Liberal premier Kathleen Wynne, who still sits in the legislature as a Toronto MPP. Mr. Ford revisited some of his favourite moments during the speech, including cancelling the cap-and-trade system, reducing gas and hydro prices, and funding more hospital beds to ease overcrowding. Outside the rally, a sign supported Mr. Ford’s nephew, Michael Ford, who is running for re-election to Toronto city council in Etobicoke North and was also at the event.